The entangled ecological, economic and social crises addressed by degrowth are not a new phenomenon and have been experienced globally for quite some time. However, it is exactly now that the crises of our times are particularly visible, with ongoing wars, most notably in the Middle East, new reports on accelerating climate change, as well as massive forced migrations being the reality of our times. In addition, even the previously seemingly stable political contexts of the Western world are potentially facing dramatic changes, with Brexit and the recent US elections being remarkable examples of this. This makes it possible to argue that we live in turbulent times – full of anxiety, insecurity and fear. The other side of the coin, however, has been the rise of new organising practices, global solidarity and courage, and hence potential for transformation in line with the principles of ecological sustainability, social justice and human flourishing as advocated by degrowth. For the latter potentiality to be realised, global dialogues are needed – between and within different geographical regions and worldviews. Within an academic and activist context, it is crucial for degrowth to build dialogues with other transformative movements and schools of thought. The 6th degrowth conference will have precisely such an aim. The dialogues will be built across the two main areas. 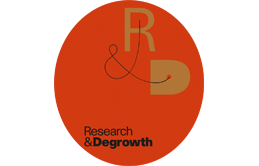 First, the conference will further expand the geographical and thematic scope of degrowth discussions, advancing degrowth debates in the Nordic contexts, as well as the Middle East, and covering themes such as welfare state, migration, war, technology and money. Second, the importance of dialogues with critical social theories (e.g. anarchism, feminism, Marxism, postcolonial theory) and science (e.g. climate science) will be emphasised and such dialogues are to be stimulated during the conference. The location of the conference fits the aims of the conference very well, with the above described turbulences echoing within Sweden and the Nordic countries too.